Provides combined effect on maxillopods. 1 g of Crustacid contains 10 mg of diflubenzuron as an active ingredient. It is a drug against maxillopods. Diflubenzuron (a component of the drug) has harmful effect on crustaceans parasitizing fish. Mechanism of action is based on chitine formation inhibition in cuticle of lernaea and argulus. As a result, covering integrity damage and molting block cause death of maxillopods. 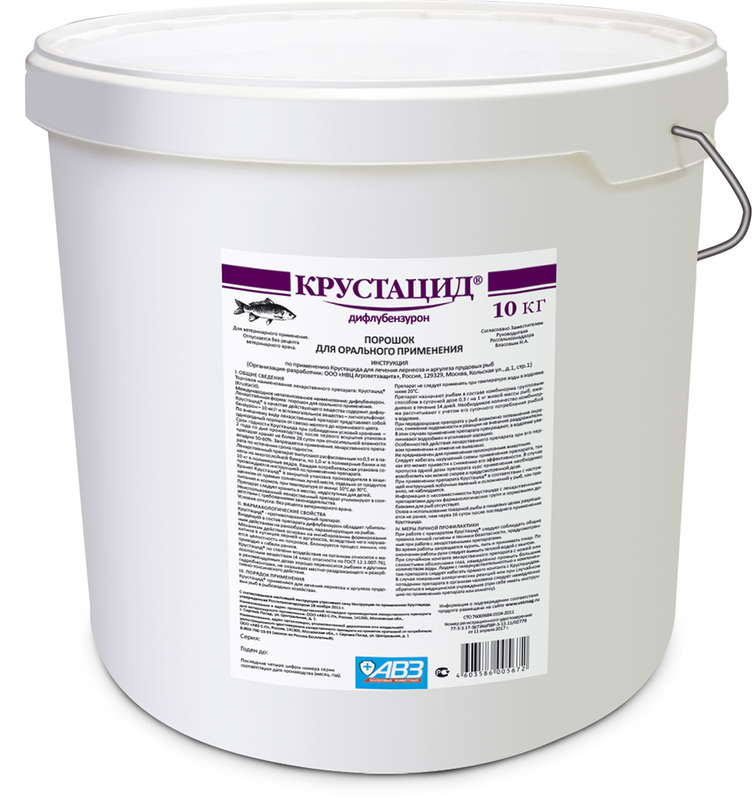 Use to treat fish lernaeasis and argulusis. Daily dose is 0.3 g per 1 kg of body weight, administered with feed within 14 days in succession. Feed amount is calculated on the base of daily consumption by free group feeding. Water temperature must be ≥ 20°С. Overdose: potential body blackening, decrease in mobility and reaction to exogenous irritants. In this case stop feeding, increase water exchange and aeration. Fish can be caught and eaten in 16 days after the last drug administration. Store in closed original package. Protect from moisture. Store separately from food and animal feeding at -10…+30°С. Shelf life is 2 years from manufacturing date.